The Indian River Lagoon is one of my favorite places to photograph on the east coast of Florida. The night sky transformed this familiar place into something magical. Palm trees along the shore are silhouetted by the light from countless stars. This photo reflects about 40 minutes exposure, using a Nikon 16mm fisheye lens. 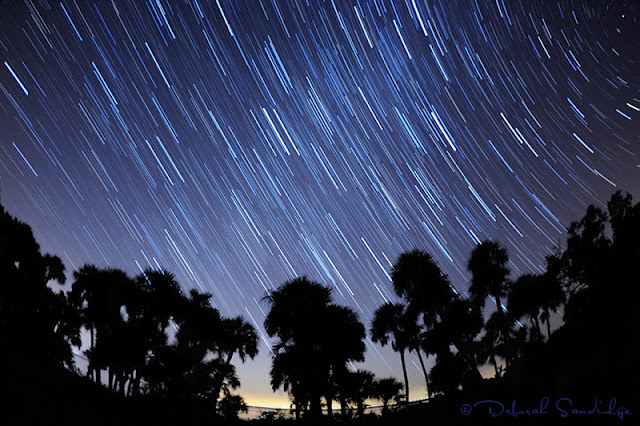 The position of the camera (facing west) creates a "falling star" look (arc) rather than the concentric circles that occur with the camera oriented north or south. What do you need for photographing the night sky? You'll need your camera, tripod and shutter release. Determine the white balance by making a few test shots. I dialed in a white balance setting of 2500K. If you are shooting consecutive images, turn off noise reduction as the longer interval between shots will leave gaps in your star trails. I used my camera's interval timer to shoot the stars in this photo. I also use Nikon's MC-36 multi-function remote, and I'm experimenting with a Promote Control. You can also make a single long exposure if you wish, anything goes! Interested in night photography? Come down to Florida's Birding & Fotofest this spring! I'll be presenting on night photography, infrared, and how to get creative with photography and Photoshop. Hope to see you there!